That’s why I think following a healthy meal plan is such a great idea and why I truly enjoy creating these meal plans (plus I get to try a lot of different foods in the process). The plan focuses on low or medium glycemic carbs spread out throughout the day to support stable blood sugars and keep hunger at bay. 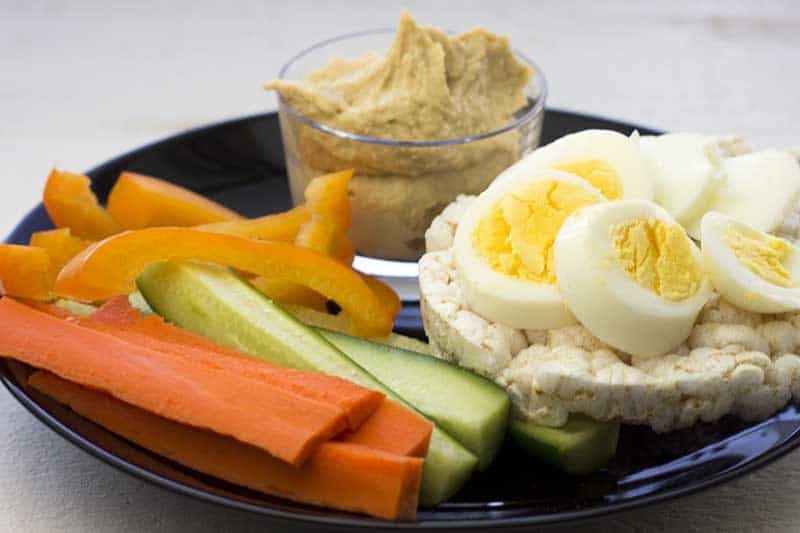 That, in combination with lean proteins and healthy fats, is a winning combination whether you are looking to maintain, gain or drop weight. If some of the meals in this plan don’t work for you, you can always look at my other meal plans for substitutes. Mix and match as you like, just try to match the macros (carbs, protein, and fats) for each meal. If you have read Strong With Diabetes Meal Plan #1 and know how to calculate your daily calorie need, you can skip the next section and go straight to the meal plan. We all have different calorie needs. Your daily calorie need depends on your size, fitness level, daily activity, gender, etc. When you are creating a healthy diabetes meal plan, your first step should therefore always be to calculate your “calorie equilibrium”, or how many calories you need each day to maintain your current weight. You can learn exactly how to find you calorie equilibrium with 5 easy steps in this post: “How to Find Your Daily Calorie Need“. Once you know your calorie equilibrium, you can adjust your daily calories up or down to meet your goals. If your goal is to lose weight, I recommend that you eat up to 500 calories less than your equilibrium each day (but no less than 1,200 per day). This should lead to a steady and healthy weight loss. If you want to gain muscle, start out by adding in 300-500 calories more than your equilibrium each day and see what happens. If you find that you are also putting on a little too much fat, decrease your calories slightly. Now that you know how to calculate your daily calorie need, you are ready to create a healthy diabetes meal plan. Well, I say create, but you can really just use the plan in this post as it is. I have already calculated all the macronutrients (calories, carbs, protein, and fat), so you just need to choose the calorie level that is right for you. The example below is for a 1,600 calorie/day plan, but you can download the meal plan as a PDF with many different calorie levels. The download also includes a version with grams instead of ounces for my international friends. 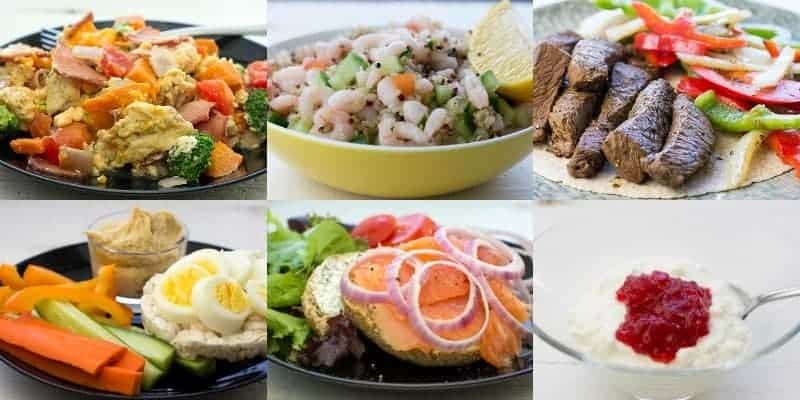 This meal plan has a calorie split of 30% carbs, 40% protein, and 30% fat, which is what I generally recommend for weight loss (you can read “How to Lose Weight When You Live with Diabetes” for more details). If your goal is to build muscle, I recommend that you increase the carbs to 35-40% of your daily calories and decrease the fat to 20-25%. If this sounds a little complicated, you can simply add 20 g carbs to meal 4 or meal 5 (20 g carbs equals: 1 oz. oats, 3 oz. rice (cooked), 3.2 oz. sweet potato or quinoa (cooked) or 2.5 rice cakes). I know that healthy nutrition (and especially how many carbs to eat) is a topic that causes a great deal of discussion in the diabetes community. I make no claim that my approach is the best or only way to do it, but it’s what works for me and the clients I work with. If you are doing something different that works for you, then definitely keep doing it! This is a 1,600-calorie example. 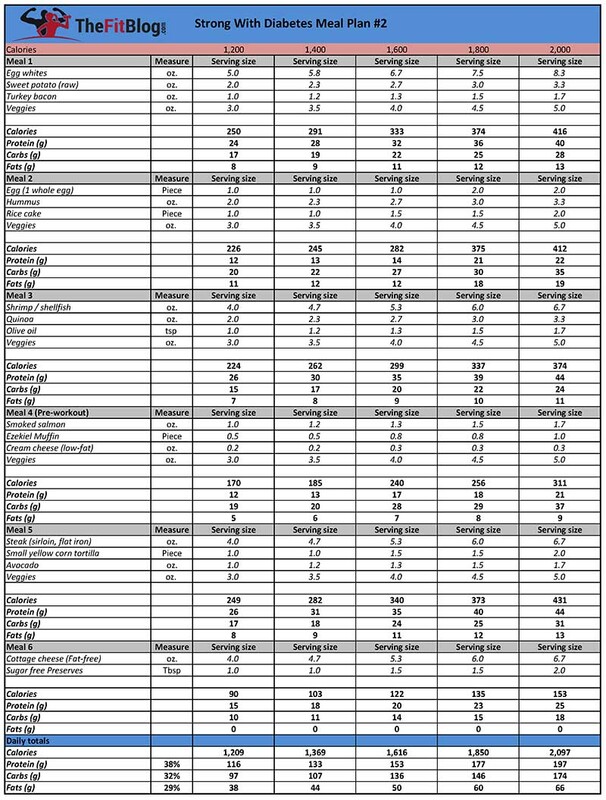 You can see other calorie levels in the image at the end of this post or download them here. Instructions: Boil and peel the sweet potatoes. Cut potatoes and the washed veggies into bite-size pieces. Coat a skillet with cooking spray and put over medium heat. Cut the bacon into 6-8 pieces and cook for about 2 minutes (or until browned). Flip over bacon, add potatoes and veggies to the skillet and let it cook for 2-3 minutes. Whisk the egg whites with salt and pepper and add to the skillet. 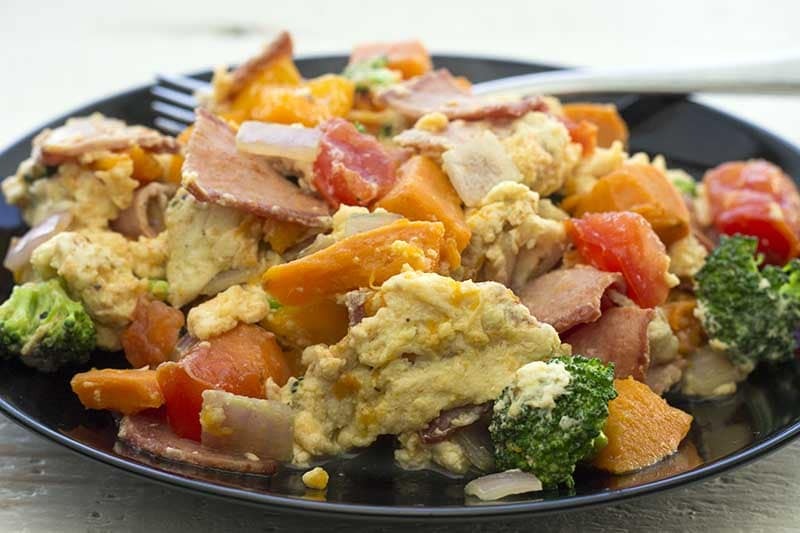 Scramble until desired consistency (simply keep moving the food around on the skillet using a spatula). Pro tip #1: Cook a big batch of sweet potatoes and keep in the fridge. 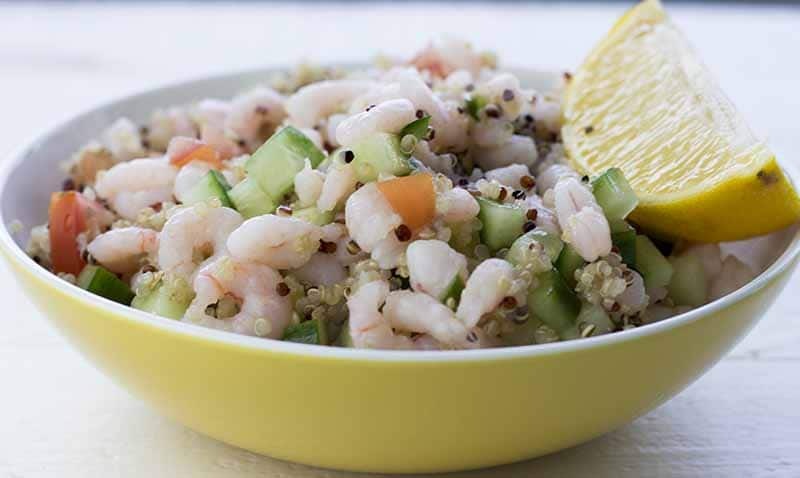 Instructions: Mix quinoa with veggies, and toss with olive oil, salt, and pepper. Fold in shrimp. Pro tip #2: Always cook quinoa (and rice) in chicken or vegetable broth instead of water. It tastes MUCH better that way. Instructions: Toast the Ezekiel muffin. Mix basil, salt, and pepper with the cream cheese and spread on the muffin. 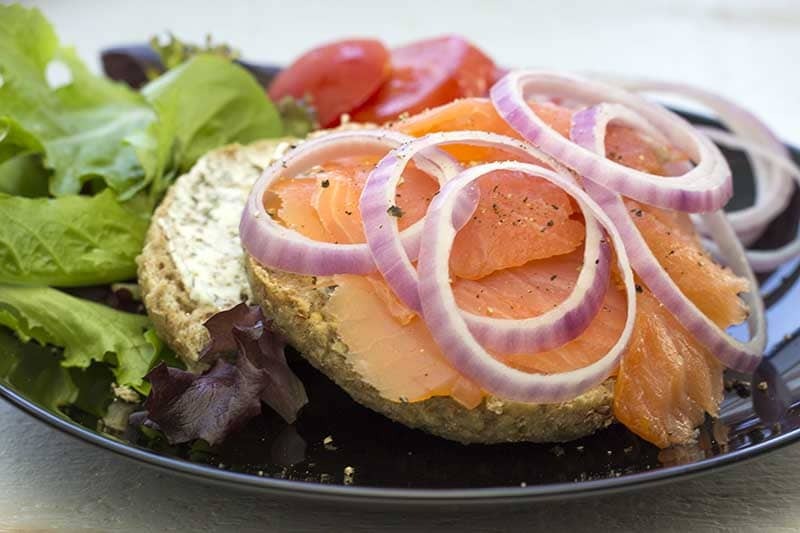 Top with smoked salmon and sliced red onion. 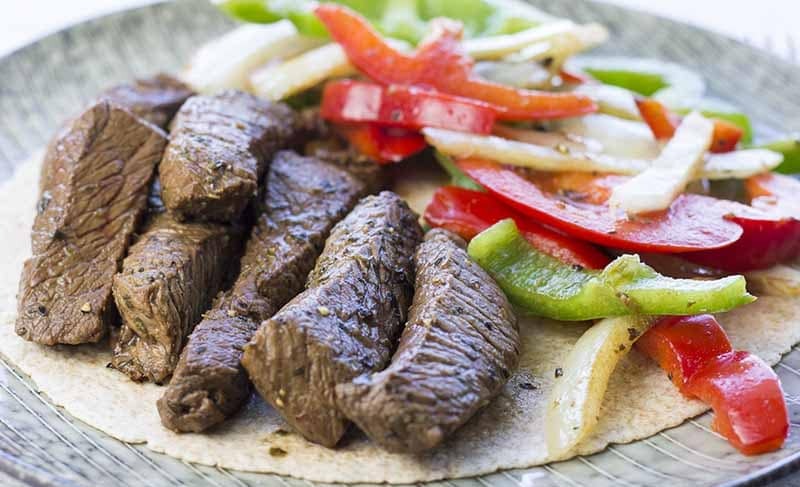 Pro tip #1: The meat doesn’t have to be marinated and can be eaten cold as well. 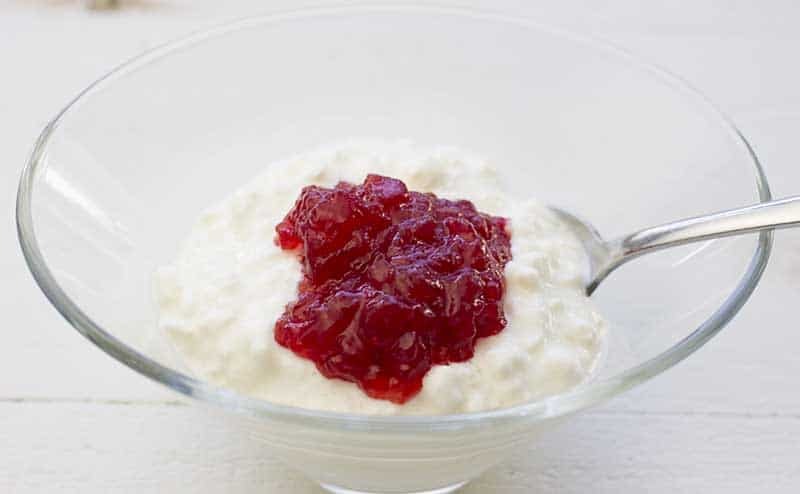 Instructions: Mix cottage cheese with stevia and serve with jam on top. Daily totals: 1,616 calories, 153 g protein, 136 g carbs, and 50 g fat. I like to eat the same foods for several days in a row with only minor changes and then change the plan every week or so. I would suggest that you follow this plan for a week and then start on the next plan (which I will post in a week from now). You can also go back and follow my one of my other meal plans for another week. If you click the image below, you will get the option to download the meal plan as a document that also has a version with grams instead of ounces.